Have you found an online vendor selling Mount Gay Black Barrel? Mount Gay Black Barrel is a small batch, handcrafted rum recently created by master distiller Allen Smith. It is a blend of both matured double pot distillates and aged column distillates which are finished in Bourbon oak barrels. The unique blend delivers a bold and balanced flavour. LOTS of oak and spice, some alcohol afterburn. It's good, but there isn't enough going on here when you drink it neat. An ice cube brings out some sweetness and makes it smoother. Still, there are better sippers and mixers out there, from Barbados and elsewhere. Charred oak barrel notes open up to leave you with a classic pot still Bajan rum. I enjoy sipping bourbon and whisky, preferably neat. Occasionally I'll add a teaspoon of water just to open up the bouquet. Feeling the need for a change of pace, I went on a safari for something bearing the Mount Gay label, at the suggestion of a friend. I opted for the Black Barrel, because I just happened to have a bit extra to spend. Damn good stuff, sir! I don't have much experience with rum, but from the very first sip I LOVED this stuff. I was floored by the vanilla, raisin and floral taste -- and that peppery after taste! All I can say is YOWSA! This is a fantastic rum, the price is about right for it. I'm not sure, why people are so divided on this one. I'd recommend it on the rocks or straight. There's a hint of cherry in it it, towards the end it has a strong note of charred barrels. Recommended. Having just started drinking rum from brandy I find this to be my favourite, I always drink straight and this is a very colourful drink taste wise. Would recommend to anyone! When I first tried this rum a couple years ago, it was relatively new to the market, and there seemed to be a lot of marketing hype around it. I thought it was all a bit overblown, and the introductory price was somewhat inflated. Now that the price seems to have come down a bit, and I've done quite a bit more tasting of this and other rums, I'm appreciating it more and more. In many ways it seems more "grown up" than many other over-sweetened rums on the market. I think part of this is Mount Gay's attempt to dig into the whiskey market—a drink that is more highly esteemed (and priced) in this country. That certainly manifests itself in the flavor profile, which is dry, oaky, and slightly spicy. With characteristic sweetness and a caramel nose, you certainly wouldn't confuse it for whiskey. This is a proud rum. I give it a 7.5, and round up for its somewhat unique spot in the market. With a little more aging to polish off its somewhat abrasive edges, it would be a solid 8. As it is, Mount Gay Black Barrel is a versatile rum that makes a great Old Fashioned, a solid Bajan Rum Punch, and a decent sipper. Just don't spend more than $30 USD (2/2017) on a bottle if you can help it. Very good! One of my favorites. I drink it neat or with just ice. Bottled at 43% which is always a good thing for rum. Candy cola on the nose and palette. It opens up to a bit of lemon grass and smoke. The body is on the thin side which helps keep things bright. Finish is lingering and somewhat sweet but not a sugar bomb by any means. Can’t go wrong with the Black Barrel in your tiki drinks either. I prefer this over the Black Seal or Plantation rums for mixing. Feel: Clean with not too much burn. Taste: Sugar, LOTS of wood. A little nutty. Presentation: Very nice long neck bottle. Distinctive. I really what Barbados has done with the country of origin sticker. More countries should do it. A little cheaper than the XO and it shows. Lacking the bold body but still quite adequate for sipping. I think I will be using this mainly for drinks that call for a Barbados rum so I have more XO left over for sipping. This was recommended to me from a liquor store owner. He sure knew what he was talking about very nice rum. I didn't like the harsh bite of this rum. Very strong alcohol burn, and hints of pepper in the aftertaste. If asked for a one-word description, I would call this rum "unfinished". I'm a fan of Mount Gay and while I prefer their XO, the black barrel is a fantastic value and thus why I give it an 8. Actually, scratch that. I just drank black barrel and the XO back to back and I am enjoying the BB more than the XO. They are very close, but I like the flexible BB characteristics more than the stronger flavors of the XO. I can drink this neat or on the rocks and both are wonderful experiences. Neat is a bit on the spicy and dry side (which I like) but on the rocks also brings out a nice more mellow flavor that is still slightly sweet and very pleasant. Every way to drink this rum is a good rum and for the price you feel liberated to try anything without any guilt. Highly recommend this one. Přišel jako 2. do rodiny. První byl XO. Dopiručuji připlatit. Ma sotva poloviční chuť a je hodně alkoholovy. Three top tier restaurants stock the Black Barrel for me as I drink it with fresh squeezed orange juice. It's one of my favorite drinks. I wouldn't drink this straight up but with a mixer it's great. It's certainly far above the house rum served by virtually all bars/restaurants. Found this at my local Getränkemarkt and was not too expensive for an alleged small batch rum. Found it rather medicinal, slightly rough, no real redeeming features, would not buy again. 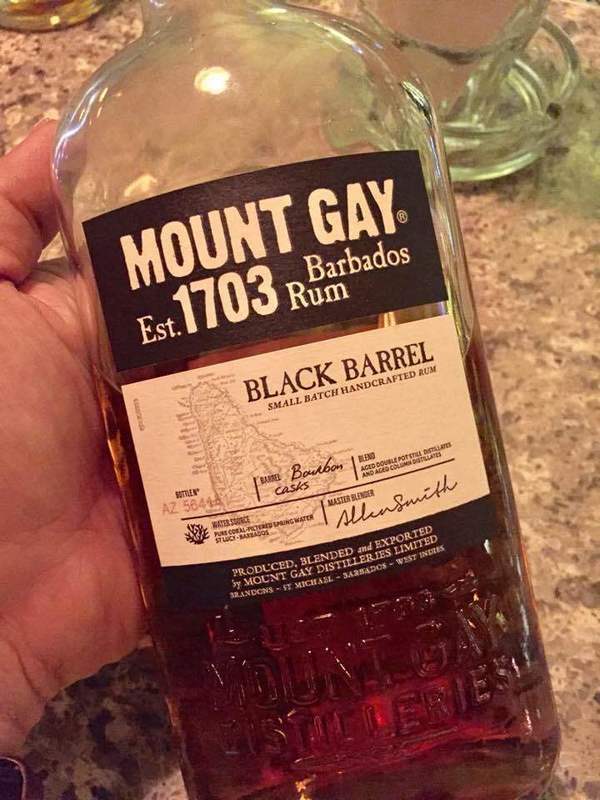 I hesitated before buying a bottle of Mount Gay Black Barrel as the Mount Gay XO is only $6 CAD more and it is my favorite rum. No regrets, the Black Barrel while not as good as the XO is also a fantastic rum. I really enjoy the overall taste but would prefer it less spicy. Nevertheless a truly fantastic rum. It burns if you over sniff on it but there are pack with aroma. Candy floss, caramel, fruits cake with raisins, spices such as cinnamon and vanilla and bitterness of dark chocolate. Light with woody and caramel flavor. Charred bourbon flavor which stands out a lot compare with most rum, banana peel and dry German apple schnapps (apfelbrand). Peppery burning sensation which I enjoyed but not so sure for others. Tropical fruits on the finishing. Minty flavor. Dry tannin mouth feel and tickling on the throat. I liked this one. A little bit harsh at first but it has good flavours. In my opinion it's better than mount Gay XO. I could sip this but I do like to mix it. This is a great straightforward sipping rum, even my non-rum drinker friends love this stuff. For the mixologists out there I find it does amazingly well with a quality coffee liqueur and creamer for a Rum Russian. Great drop, smoother than the eclipse, worth the extra money. I'm not saying this is the best rum money can buy...but for the price and wide-spread distribution in my neck of the woods, I think it makes a pretty strong case for itself. This rum has a fairly bourbon-y flavor, and since bourbon is my other favorite spirit, that probably explains its appeal to my palate. Oakey, a little sweet, with a touch of syrup and strong banana notes. This one works well either straight-up or cut with a cube of ice, if you want to make it a bit less sweet and more refreshing. The run has little finesse or complexity. Overly spirity. Perfectly drinkable but not as good as Chairman's Reserve at 2/3 the price (this is £30 a bottle, Chairman's is £20). I guess in that respect Remy Cointreau have been successful, but like many rum brands owned by big groups, they are more interested in the profit than the product. Not a rum I will be buying again unless there is nothing on the shelf. EDIT - the more I drink it, the less I like it and I am sitting here thinking how I am going to finish the bottle!